This recipe produces melt-in-your-mouth dairy-free vegan banana chocolate pancakes that are one of the best excuses to eat chocolate in the morning. The banana and chocolate are cooked into the pancake itself making every bite full of flavor. Make this recipe into "chunky monkey" pancakes by adding your favorite nuts such as chopped walnuts or pecans. A typical pancake recipe may contain milk or eggs. This recipe simply uses baking powder to make the pancakes fluffy. Soy milk or almond milk replace the cow's milk. In a medium-sized mixing bowl, combine the flour, sugar, baking powder, and salt until well combined. Add 1/4- to 1/3-cup portions of batter to the griddle or frying pan. Sprinkle on enough chocolate chips to cover the batter on the griddle. Cook until the pancakes are golden brown on each side. 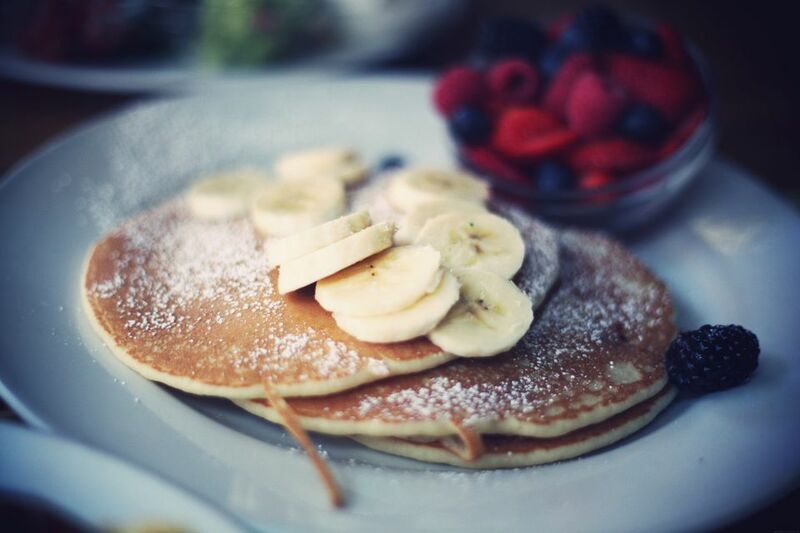 Serve the pancakes immediately with maple syrup and fresh banana slices. Pancakes are delicate. To make the best pancakes possible, make sure to do two things: don't over-mix the batter and don't overdo the heat. If your griddle is too hot, the outsides of the pancakes will burn before the middle even begins to cook. The good news is it's an easy fix. If you see this happening after your first pancake, remove the pan from the heat, lower it and return to the stovetop. Unfortunately, you may have to toss that first effort. Remember, when making pancakes, it's better to err on the side of being too cautious and having your pancakes take a little longer to cook than to burn the outside and have a gooey middle. Given the mashed bananas and chocolate chips, you want to be extra careful to ensure the pancakes come out cooked evenly. Another way to ensure you get the best vegan pancakes is by perfecting your flip. It's not as simple as flipping when you see bubbles. You should wait until bubbles form and then pop, staying open on the surface of the pancake. Last but not least, use the chocolate chips sparingly. Archaeologists have found that pancakes might be one of the earliest and most widespread starch-based food eaten throughout prehistoric times.